New templates for Carl Bleile's tool points !!! Carl Bleile did a wonderful article in the last Fega newsletter about his sculpting technique; pictures of this technique can be seen in Carl’s photo album along with banknote style engraving. This may seem to be a new method of sharpening but Carl says it’s been around for 100 years yet somehow has gotten lost in the new methods. 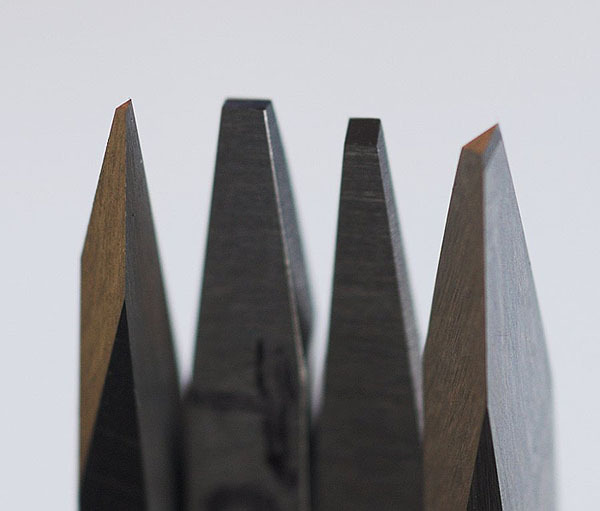 These tools are efficient, cut aggressively, and need less sharpening than usual. They are strong enough for hammer and chisel, push, or the complete line of Lindsay power tools. (3) background removal tool with special side grinds to get around main area without nicking. (4) medium to deep outline, removing background in tight areas, preparing for background removal and gold inlay. Carl sent the chisels and scrapers he uses and we are designing templates for them. After Carl double checks them, I'll have the first batch of them made and available for purchase. He could then help with tips and tricks for using them. Here are close-up pictures of Carl's tool points. Re: New templates for a new style of tool !!! I see the chisels and am aware of their use but I don't see any scrapers. Is this correct or did I miss something? 2 as in second from the left. The templates should be here very soon. I have used this style of tools for many years. they are very versatile ( banknote,bulino to gold inlay ) less prone to breakage, and east to sharpen, 3 of the tools only need the face touched up then back to cutting. To answer a question ahead of time I designed these tools to make the work easier for engravers, I get ZERO dollars and don't expect to. It's like repaying the old engravers that taught me by passing this on to others. Teaching a newer person is like shaking the hand of an old master and saying thanks. That's the kind of thing that would make a nice sig line or t-shirt. It really sums things up. I've got to get the roll case made for the other new templates I just got and send Steve the pattern for the cases (have to finish making that too). Question, are the templates for your tools about the same height as the one for the Universal point or are they tall like the original 70 degree Bulino point? Hi Mack, great to see you posting. I had the opportunity to try out some of Carl's gravers while visiting him a while back. Simple to maintain and very effective. Very durable in either a push graver (under my "iron thumb" ) or in an Airgraver. FEGA Journal issue #81 is an essential compliment to Carl's set and I hope he does another article in the near future (hint). Carl that first one the banknote bulino graver for darker lines looks great as does that last one. Looks like i am going to have to save up for Steves sharpening system and a load of cool templates. Thank you for giving so much to us all on here, Bless You, Tim. Is there anyway to get this newsletter without being a member of FEGA? I'm not an engraver, yet, but I am interested, and would love to see this article about Mr. Bleile technique. Can I get a copy anywhere? I agree with Mr London! Just joined and cant wait for the next issue of the engraver. 3/32" square graver blanks. Although you could use drill rod if desired. Thanks for sharing you experience in showing us your tools and enabling us to duplicate this style ( or the tools at least ) . As a lot of members like myself have to go it alone, having the right tools takes a lot of the guess work out of the equation. I see from an other thread that the tools are now available, and they will be on my next wish order form steve. One (hopefully not too dumb a ) question, how do you use, or how does the scraper tool work, I have read of their use, but it looks nothing like I imagined, it looks like a big plow, does it chip at the work? ?, and why not use a flat instead?? very nice pics, I wanna know what kind of steel are these tips and how they are manufactured. are their videos to show relief engraving ? I Welcome to the Engraving Forum. It is good the have you with us, after difficulties come good times too. I wish all the best for you for the future.